Nearly six-months old and almost ready for real food (not that breast-milk isn’t real, but seriously, how long can you live on this liquid stuff? Poor Ela is reaching for food on the table and we are sneaking her some nibbles and tastes here and there). A few more weeks and I’m assuming we’ll get the official go-ahead from her pediatrician. Anyway, before Ela’s foodie adventures start, she has to live through some teething. Poor baby has been drooling up a monsoon and chewing on everything in sight. It’s been happening for months now, and I just can’t imagine where these silly teeth are. Nothing has poked through yet. So far, chewing on toys has been enough. But lately, her whole hand is in her mouth and she seems more irritable than usual. 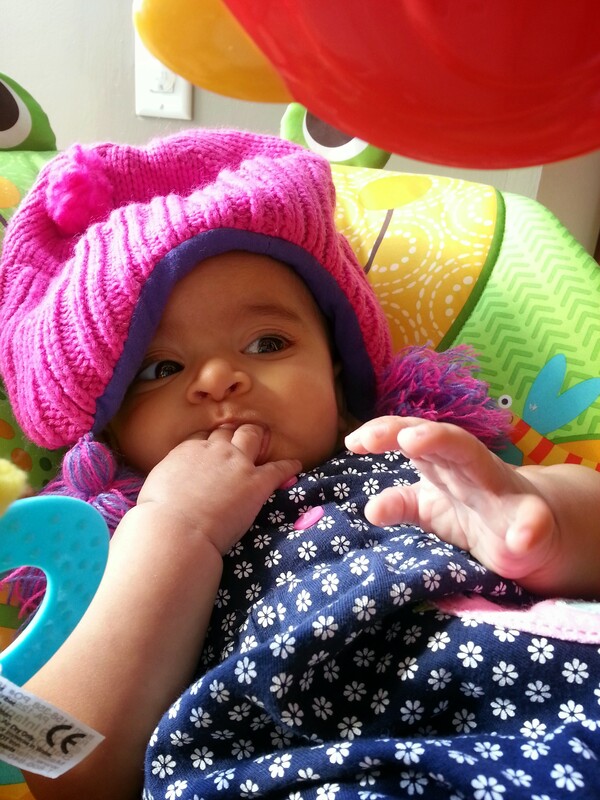 I’m teething and my sister put this silly hat on me. Not having a good day people! 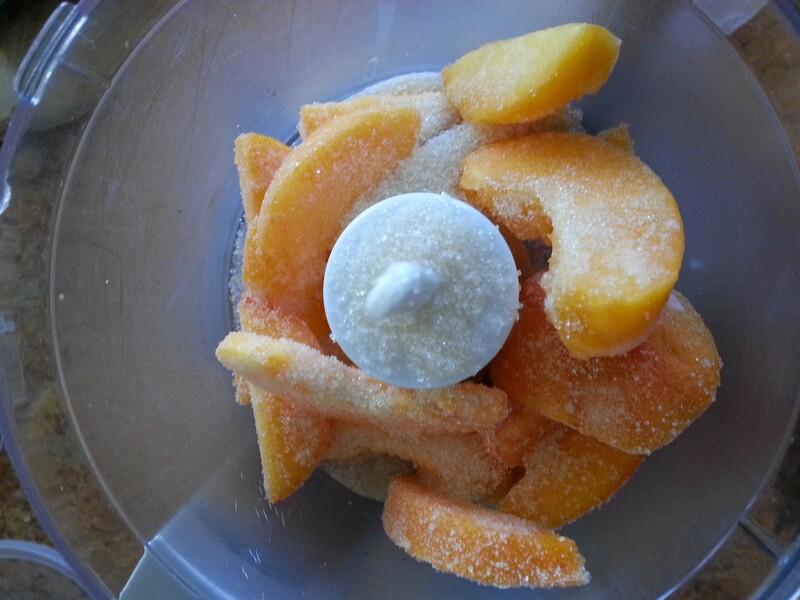 Anyway, one day Kirina and I were eating a tasty frozen experiment (also known as Peach Frozen Yogurt) that we concocted. We were at the kitchen table and baby Ela was sitting in my lap as we ate. She reached out for my spoon and shoved it in her mouth! She doesn’t like anything cold but she lapped the frozen yogurt up like a kitten. That totally got me thinking…maybe it felt good on her gums. I quickly googled whether I could feed yogurt to a six-month old (looks like you can) and gave her a few more teeny bites. She loved it! Teething Ice Cream was born! (ok, well, it’s not really ice cream, and pretty low in sugar, and I was using it mainly on Kirina to get her to eat yogurt and have her “ice cream” fix all at once, but, you know, moms always love anything that can multi-task). I thought this was a fabulous gum soother. Blend (or chop or grind or whatever button you got on that thing). Magic will occur right before your eyes! 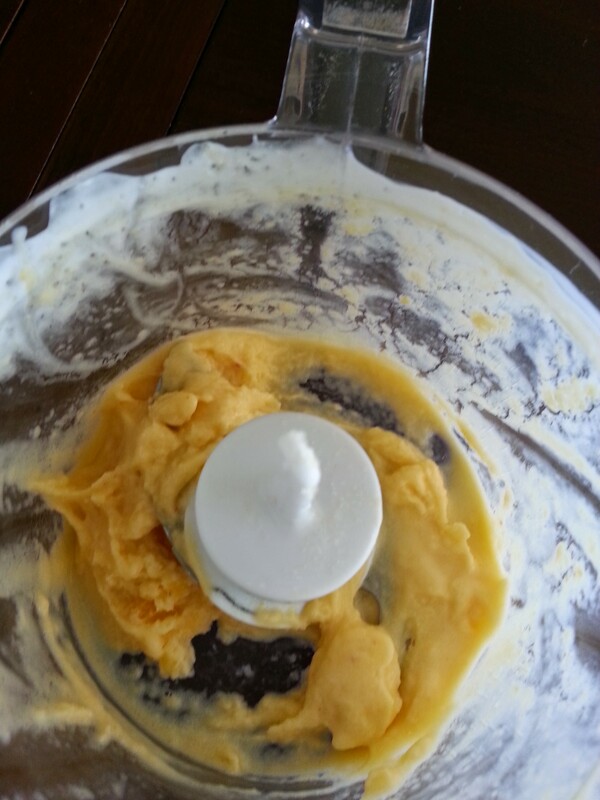 The mixture will get chunky at first and then cream into a soft-serve style yogurt. 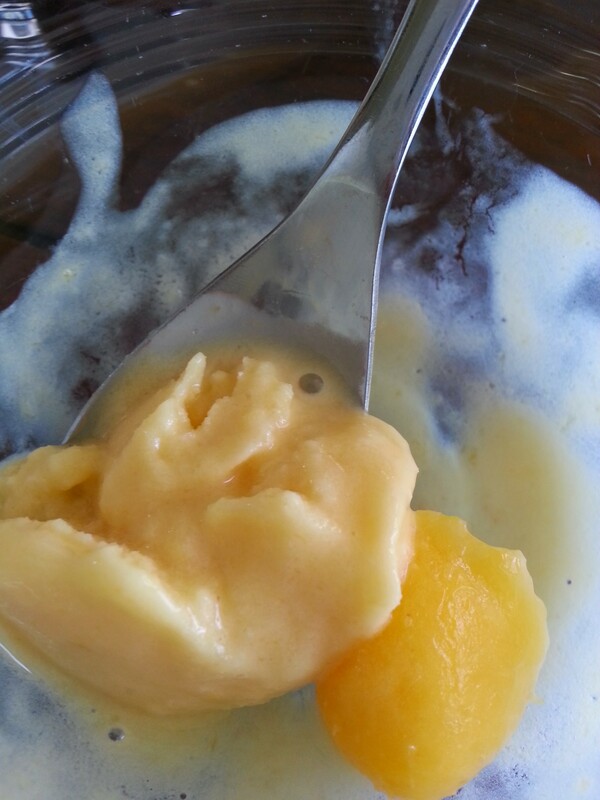 Instant, healthy, possibly organic (if you wish) frozen yogurt or teething ice cream. I can’t tell you how cool this was to watch form. Usually I have to lug out the ice cream machine, but this was done in minutes. Zweiback is a type of toast or rusk that is twice-baked (“zwei” means twice and “baken” means baked). It kind of reminds me of melba toast and is given to teething babies in Europe. You can find them here in the US as well. Italian biscotti are a close relative. Pure ayurveda. For those of you not familiar with it, ayurveda is a 5,000 or so year-old method of natural healing in India. Herbs, oils and other morsels of the earth are believed to have certain medicinal properties. Cloves have an analgesic quality. Put a little bit of clove paste onto your finger and rub into baby’s gums. To make clove paste, simply take 2-3 cloves with a few drops of water and mortar and pestle it. I don’t think that’s a verb. But you get my meaning. Not the mini carrots, but the long, garden fresh ones. Peel them first. Remember to watch your little one when letting them mouth on these. For you and for baby. Brew yourself a cup. You need it. To calm down. 🙂 Chamomile leaf has long been known to relax the soul. Dip a washcloth into tea and rub onto baby’s gums. Make sure you COOL the tea off before using. You can also freeze the tea in ice cube trays and use as a soother when needed. Yes, folks. Somewhere in the world, a baby is using this as a teether. It is a common practice in parts of Europe. I don’t know if we are brave enough to try this one. Rub a little on the gums, drink a shot yourself, everyone is much less cranky. In all seriousness, this is a very common practice for relieving sore gums. If you have milk to spare, turn them into pops! Summer treats. Simple and effective. My next-door neighbor suggested this with my first kiddo. A very common, and effective idea. The hard exterior feels good on little gums. For wearing, NOT chewing, this necklace is fascinating! Made of amber resin and worn around the baby’s neck, the necklace releases succinic acid which is a natural analgesic. The necklace must come in contact with baby’s skin for it to work. I resisted buying this silly thing for months. It was TWENTY bucks! But it works. It’s made out of a natural rubber and both my little ones found relief from dear Sophie. Old wooden dolls were given to Japanese children to mouth on. These days it is a wooden ring. Pretty cool. Read more here. Though not what you think and not for eating. Folklore says to place an egg in a sock and hang over baby’s bed. Would love information on this one! From Ela’s and Kirina’s highchair to your little one’s, bon appetit! Hi. I have been looking for ideas when it comes to teething remedies. 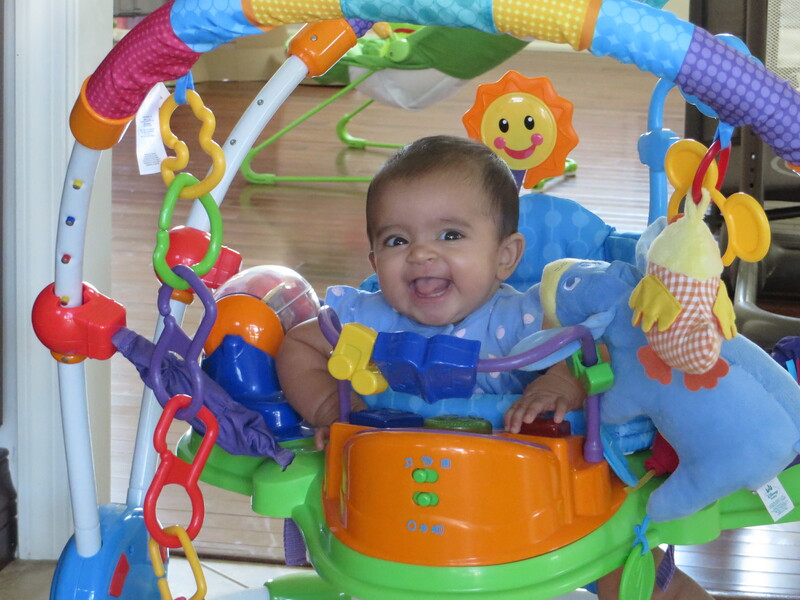 I am a first time mom and I am very meticulous when it comes to my baby’s needs. I have been searching for possible effective remedies that can ease my baby’s teething age. She is still 3 months old but she is showing some symptoms already and I am very anxious about it. Good thing I have come into your post, although I have heard some of your ideas shared, but I am still happy to know that there are still second options that has the same ideas so it might be probably good to go.